At the beginning of 2014, we heard the story of three friends who wished to become cabin crew, dreaming one day they will meet together in Paris and drink their coffee near the Eiffel Tower. 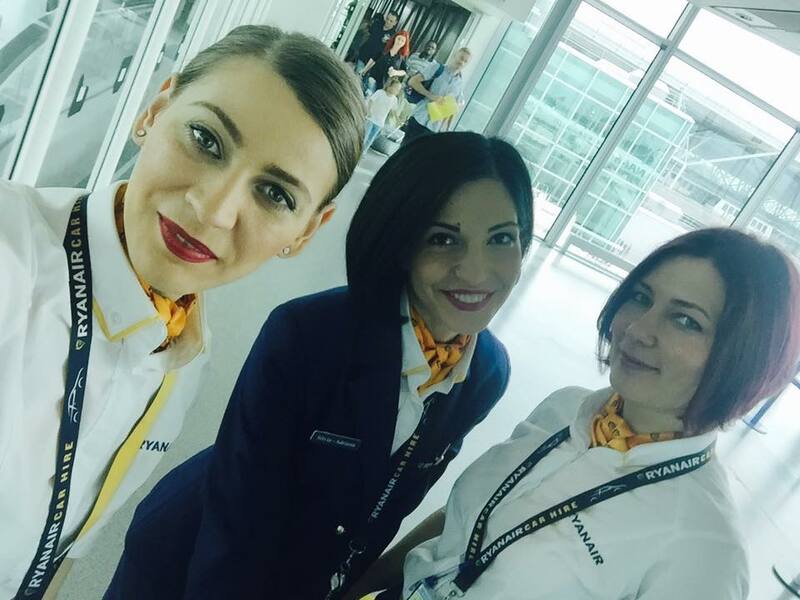 After joining the How to be cabin crew course, the three friends have become cabin crew and their plan to meet in Paris for a coffee became true. 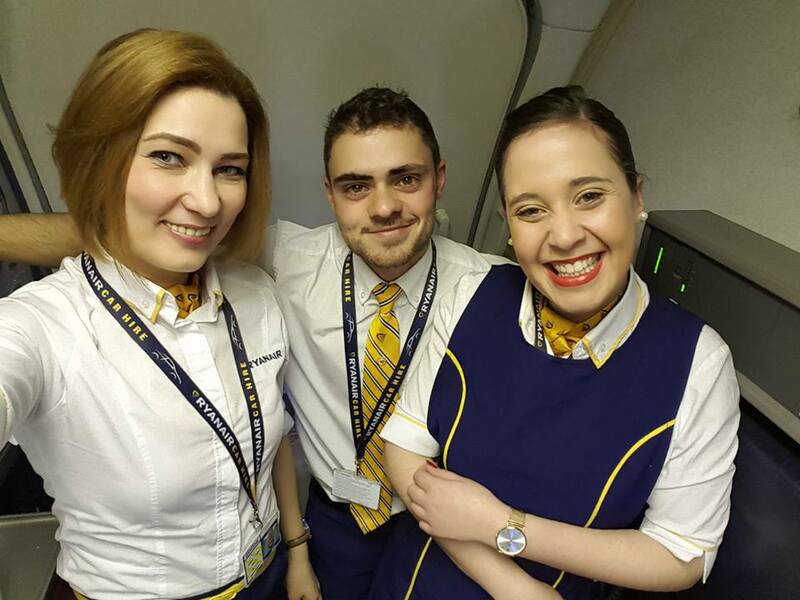 We met Gabriela, one of them, in February 2014 during How to be Cabin Crew Course in Bucharest. She had a tattoo, 28-year-old, many emotions, but despite all these, she was ready to become a cabin crew. When and why did you decide you want to become a cabin crew? Although it looks like a cliché, I’ve wanted to practice this job since I was a teenager. Unfortunately, life’s way made me choose another path – namely customer care. Throughout the years, I educated myself to reach for the moon; even if I miss, I’ll land among the stars. Now I can say I’m closer to them than ever. I chose to make a radical change thinking it could be the biggest change of my life. And, with each day passing, I get more and more convinced I took the right decision. How did your interview go? 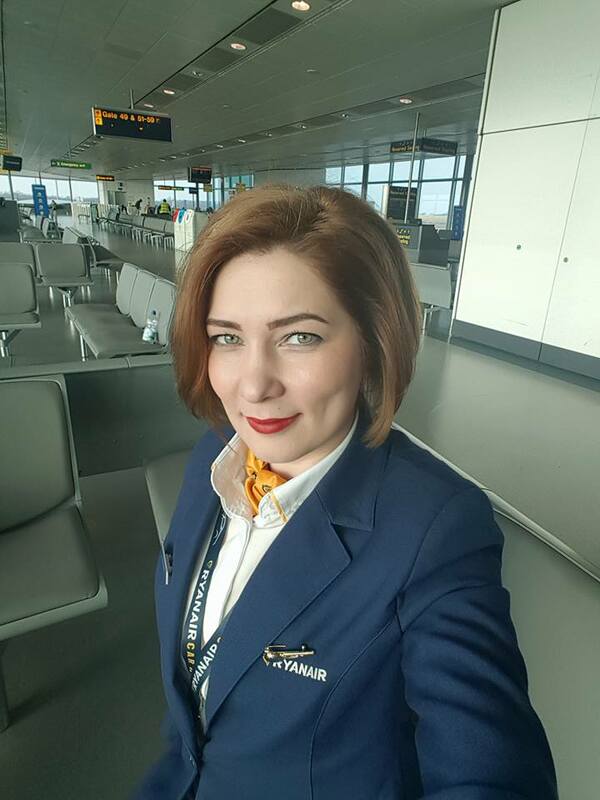 The interview seemed to me quite easy, taking into account that I’ve attended the How to be cabin crew course, where I’ve received all the necessary information and practiced various exercises. I knew I was ready and I was sure of myself (I’ve practiced my self presentation many times, in the car, while driving). We had to pass a written test too: the first subject consisted of some English grammar exercises, and the second one was requiring us to imagine we were on board and had to present the new menu; it was then that I realized the imagination was the key. It seemed it was also the winner. After the test, the selected candidates remained for the one-to-one interviews. I’ve received various questions: about the airline, about me and my current workplace, motivation for this job, unpleasant situations at the workplace and solutions found. At the end, a text was read to me and I had to answer some questions based on it, so they could test my attention. I answered sincerely during all the interview process, adding a personal note. I refused to give standard answers we all find on Google. Was it helpful for your interview all that you have learned during the How to be cabin crew course? All that I have learned during the course was of great help. I have learned how to introduce myself at a job interview, received information about a flight attendant’s life experience, and had the occasion to put into practice possible situations encountered at an interview. We’ve received useful advices based on the performance of each of us and discovered how to structure the CV in order to highlight what’s important. I’ve learned how to build my answers by inserting words that could capture the interviewer’s attention. Lastly, I’ve found out how to be confident about myself and my knowledge. I’ve left the course happy that I had the chance to meet three wonderful persons, part of the How to be cabin crew team, whom I admire for all their passion put in creating this project. What is your advice for those who are going to attend an interview? To have faith in their own dream! And patience! No matter how skilled you are, the interviews aren’t at all comfortable. A lot of practice is required: in front of the mirror, in the car, in front of two or three friends. Besides, I think if you put soul in your answers and really believe in your passion for this job, then you took a step forward (leaving your future colleagues behind). I remember you had a tattoo on the wrist. What happened to it? You are right. The tattoo was on the right hand’s ring finger. After five sessions of laser tattoo removal, taken in Bucharest, I got it removed completely. One day I made a child happy. During boarding, while I was helping passengers with their luggage, one child took my hand telling me he was knowing the captain. He confirmed captain’s name and told me he was in the same football team as the captain’s son. Once boarding was completed, while waiting for the flight documents, I announced the captain about that little passenger claiming he was his son’s colleague and knew him. The captain invited the child to the flight deck, explained him the technical details and took a photo together. During the flight, the child stopped me to thank me, telling me how proud he was about the photo. You could see the happiness on his face. How did relocating to London seem to you? In spite of the rain that looks romantic to me, I never thought I would wish to live in London. When I found out the name of my base, my best friend told me there would be no other place to better admire the clouds and the rain than London. At the beginning, it was quite hard to find an accommodation, but God brought in my way a great family, with whom I currently live. The environment is very pleasant, I adapted rapidly and I feel safe now. I’ve known people of different cultures from all over the world and I’m glad I have something to learn from everyone. I’ve also met extraordinary people who have heard about Romania, wish to visit it and speak fine words about our country. And, even I find it nice to live in London, my cabin crew bag has a little ribbon attached to it with Romania’s flag (idea stolen from another Romanian colleague). In the near future, I would like to attend the required courses in order to become a pilot. The time spent in the air looks like a magical one to me. The sky is the place where I find my answers and from where I get the necessary energy for starting new things. I wish one day I will live in France and work for Air France. I’ve flirted with the idea of practicing this job in conflict areas, but those who care for me want me to be courageous on the ground. Become cabin crew with our help! The How to be Cabin Crew course fully prepare applicants for the challenges they will face on an airline interview. This course is ideal for young professionals looking to get a head start in the profession, introducing the skills and responsibilities expected by the world’s leading airlines and more importantly give them the vital information and coaching that will help to ensure they perform on their recruitment day and in their interview to their best advantage. Book your place now – click here! This course is designed to help you to prepare for cabin crew interviews with ANY international airline.